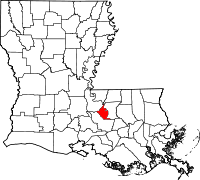 West Baton Rouge Parish, the smallest parish in Louisiana in total land, has a public records department attached to the Clerk of Courts. Records kept by the department include marriage, property, and others, and they are available from dates back to 1812 when Louisiana entered the U.S. as an official state. The parish directs users to utilize its eSearch Index, which has several subscription options, stretching from one day for $12.50 to a full year for $550. Also available is a free guest account which allows searching only, and no printing. Port Allen, the parish seat, is home to the West Baton Rouge Museum, a museum which includes several historical buildings standing since the early and mid 1800s. In addition are a large number of registered historical places, as well as several yearly festivals, such as the SugarFest which places emphasis on the area's large sugar cane production.